’ve already professed my habit of pairing crafting with wine. This leaves me with plenty of wine corks, but luckily, that just means a new material to make something cool with. 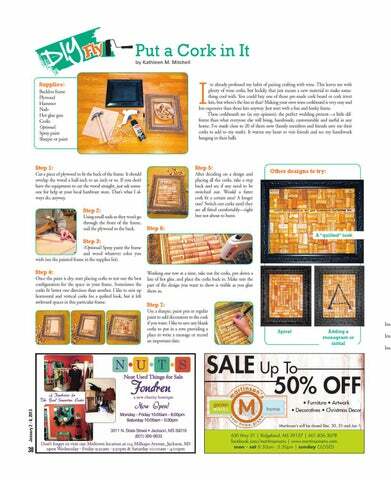 You could buy one of those pre-made cork board or cork trivet kits, but where’s the fun in that? Making your own wine corkboard is very easy and less expensive than those kits anyway. Just start with a fun and funky frame. These corkboards are (in my opinion), the perfect wedding present—a little different than what everyone else will bring, handmade, customizable and useful in any home. I’ve made close to 20 of them now (family members and friends save me their corks to add to my stash). It warms my heart to visit friends and see my handiwork hanging in their halls. Cut a piece of plywood to fit the back of the frame. It should overlap the wood a half-inch to an inch or so. If you don’t have the equipment to cut the wood straight, just ask someone for help at your local hardware store. That’s what I always do, anyway. After deciding on a design and placing all the corks, take a step back and see if any need to be switched out. Would a fatter cork fit a certain area? A longer one? Switch out corks until they are all fitted comfortably—tight but not about to burst. Step 2: Using small nails so they won’t go through the front of the frame, nail the plywood to the back. Step 3: (Optional) Spray paint the frame and wood whatever color you wish (see the painted frame in the supplies list). Step 4: Once the paint is dry, start placing corks to test our the best configuration for the space in your frame. Sometimes the corks fit better one direction than another. I like to mix up horizontal and vertical corks for a quilted look, but it left awkward spaces in this particular frame. Working one row at a time, take out the corks, put down a line of hot glue, and place the corks back in. Make sure the part of the design you want to show is visible as you glue them in. Step 7: Use a sharpie, paint pen or regular paint to add decoration to the cork if you want. I like to save any blank corks to put in a row, providing a place to write a message or record an important date. Martinson’s will be closed Dec. 30, 31 and Jan 1.